The Delayed Harvest trout fishing season ended Monday, May 14. Known by staunch supporters of this popular trout management program in the state as “slaughter week.” Tens of trout had a meeting with an iron frying pan as a result of the opening of waters under the delayed harvest program. 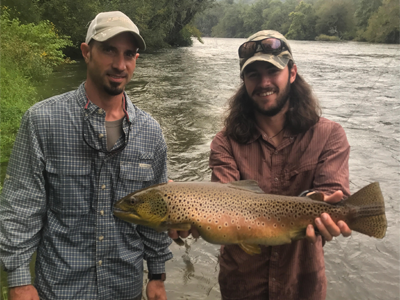 Some waters under the program are a marginal habitat that becomes too warm to support trout during the summer, which justifies the killing date. However, some streams are perfectly capable of supporting trout through the warm weather month. More than 31,000 trout will exit the gates of Georgia’s state and federal trout hatcheries this week. Given the heavy rainfall, here are WRD trout stocking coordinator John Lee Thomson’s best bets for this weekend: Right below the dams of the Lanier and Blue Ridge tailwaters Tammen Park/Fannin County, Wildcat, Dicks, Boggs, Sarahs, Amicalola Park after the Saturday morning kids fishing event, Rock, Hooch on WMA, and Tallulah.